Be honest, with the New Year upon us, spending more time with family has crossed your mind. But how can you make your work folks and your family happy? Is that really possible?! Are there people who actually live feeling confident that they are giving ample time to both? If they exist, are they delusional?! Let's talk, I have some suggestions for helping you get at managing work and family this year on beyond. I'm sure you will tell me in the comments whether I'm delusional or not! 1) Health? 2) Money? 3) Other? —"It's not quite a resolution but more of a dedication to spend quality time with each daughter in a mixture of both exercise and 1:1 conversation. The tricky bit will be the arrival of child 3 in May." —"The best parent I can be to my babies." —"My children are grown....but as a grandparent, my resolution is training my grandchild in the way she should go, so when she is old she will not depart from it." —"...my resolution is family and friends...they need me..."
Here's the deal. I'm constantly battling that feeling of being too busy and yet regretting that I'm neglecting "the other side." When I'm at work, I'm thinking about my wife and daughters. When I'm home, I'm thinking about work. Am I alone? Rule number one, use one calendar. Enough of this business of checking several different calendars. No more keeping a work calendar AND a personal calendar. One life, one calendar (Let's get #OLOC trending, y'all). I use my iPhone calendar and the Reminders app with daily tasks and deadlines for everything. Simple step one, right? Next, think in big chunks first and then get more detailed with smaller, daily tasks. If you read our handy-dandy 7 Habits of a 24/7 Dad it was this: Put First Things First. Remember, big rocks then pebbles, then sand. If you put sand first, nothing gets in! Work: Think ahead a year in advance. Go ahead and carve out blocks of time for those things you know are going to take place. Here are a few examples: staff retreats, fiscal year-end stuff, vacation, holidays at your place of business. Add each of these items as repeating events to your calendar. You will thank me next year too! Family: You're going to take some vacation or you'll lose it the time. So, put that on your calendar now. And work or travel items, add them. It helps me to think seasonally here. I have certain trips I like to make during certain times of the year. Fall leaves in the mountains? Yes, thank you, I'll have some of those! Check. More ideas: holidays with one side of the family? Get these things on your calendar. No surprises for you in 2014. Work: Add any and all monthly reports. Add those to your calendar now. Tip: Also add as the prep time you need these meetings. No more last minute anxiety! Family: I have a few ideas for this one: date night with your spouse. Put the event on repeat. Tip: how about buying concert tickets for 2014 now? Trust me, it’s more difficult to cancel a concert you and your spouse want to attend. You'll certainly find childcare for a “big event.” Also note, the item is litterally on your calendar as "Date Night with my (your wife, not mine) wife" so you will feel bad if you manually replace said date night with something less meaningful. Work: You know you have weekly “TPS reports” that must be finished by 9am on every Monday. Get it down on the calendar once and for all. Family: Add “Family Night” to your calendar on a weekly basis. Maybe this is family dinner and playing Xbox 360 Kinnect. But the idea is to have it on your calendar. You don't forget what's important. Work: What tasks do you do every single day? From lunch to checking email. Add these 15 minutes blocks to your calendar. This includes personal breaks. Why? Your calendar shows up as “busy” when someone tries to schedule another meeting. You're "busy" because you're meeting with an important person: you! Family: Here are a few things to add to your repeating daily reminders: I have “7 p.m.: Bath and read to my girls.” Yeah, I tend to multi-task bathtime. I have a captive audience at bathtime. For the Sanders Girls, bath time is when we learn all the fine literature that dad brings to the bathroom—wait—this came out wrong. But seriously, for those of you with younger kids, redeem the time! For us bathtime is a great time for me to indoctrinate my girls into the musical sounds of John Mayer and Johnny Cash. Okay, I've landed in the weeds, but only a little. You get my point, right? Add items to your calendar or your reminder app. This way, and this is strictly hypothethical, if a friend wants to play tennis late in the evening, I have to manually replace "bath and reading time for my precious girls" with "tennis time with friend." Guess what? Chances are pretty good that I will decide to play that match earlier in the evening or save it for the weekend. Here's the point: Your time is accounted for, you're intentional about how you use your time. You'll notice having the above items on your calendar and in your tasks list has a unique way of showing what you value — for good or ill. You can’t control everything in life every day, but often, if you're paying attention, you can learn to manage your time. 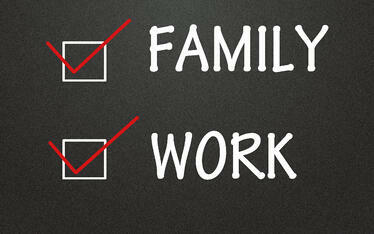 What's one thing you do to help you feel like you're managing work and family?